When Peter’s parents are killed, he is sent to an orphanage in Warsaw, Poland. But Peter is Volksdeutscher-of German blood. With his blond hair and blue eyes, he looks just like the boy on the Hitler Youth poster. The Nazis decide he is racially valuable. Indeed, a prominent German family is pleased to adopt such a fine Aryan specimen into their household. But despite his new “family,” Peter feels like a foreigner-an ausländer-and he is forming his own ideas about what he sees and what he’s told. He doesn’t want to be a Nazi. So he takes a risk-the most dangerous one he could possibly choose in 1942 Berlin. . . . 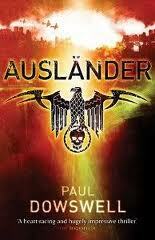 Categories: Historical, Thriller | Tags: Paul Doweswell | Permalink.